"With 30 professionally designed logo reveals ProBrand: Reveal Volume 6 will add uniquely animated logos to any photos or videos," said Christina Austin - CEO of Pixel Film Studios. ProBrand Reveal Volume 6 includes 30 unique animations. Reveal any type of logo ranging from corporate to cartoon. 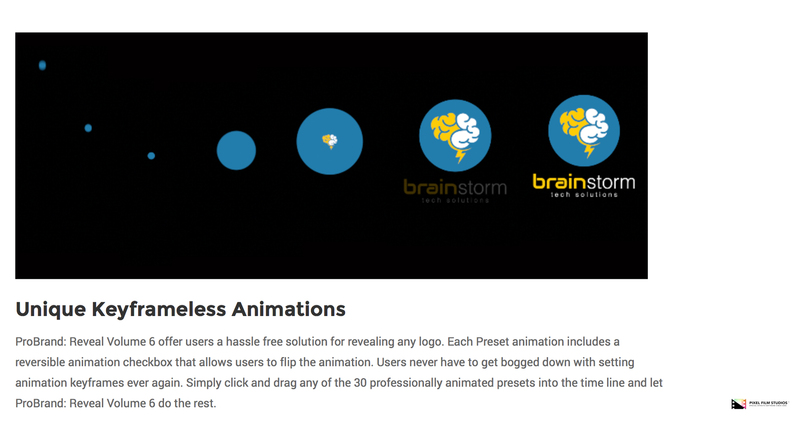 With a wide range of animations showing off any logo style. 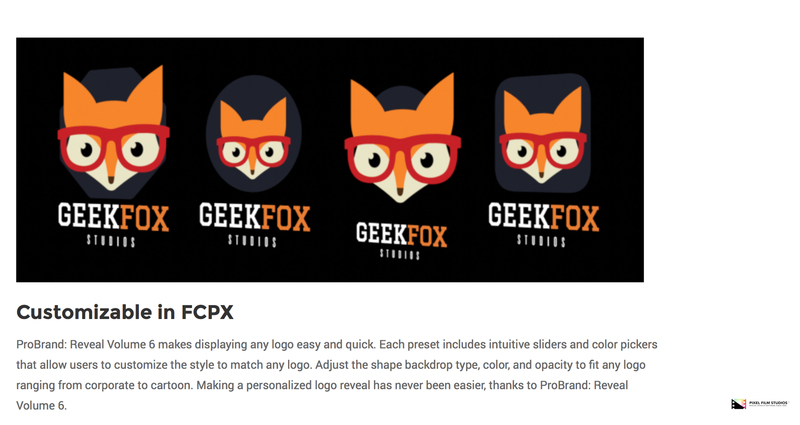 Users can intuitively modify each preset to fit any logo design. With the included sliders and color pickers, making a unique logo reveal has never been easier. ProBrand Reveal Volume 6 makes displaying any logo easy and quick. 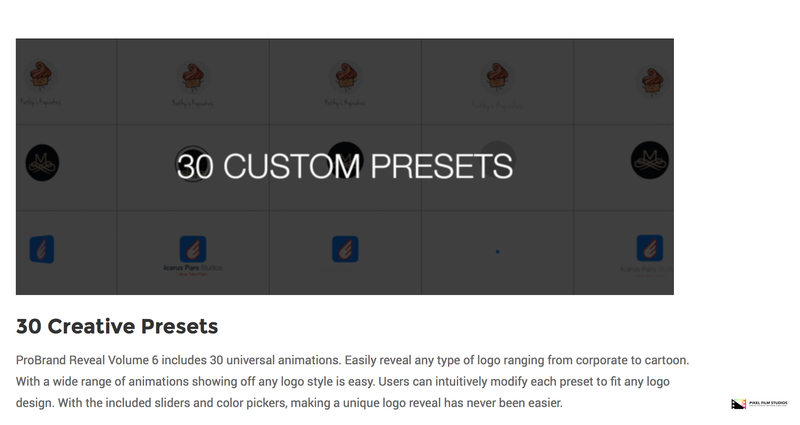 Each preset includes intuitive sliders and color pickers that allow users to customize the style to match any logo. Adjust the shape backdrop type, color, and opacity to fit any logo ranging from corporate to cartoon. ProBrand Reveal Volume 6 offer users an easy solution for revealing any logo. Each Preset animation includes a reversible animation checkbox that allows users to flip the animation. Users never have to get bogged down with setting animation keyframes ever again. 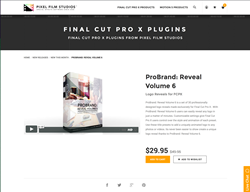 Simply click and drag any of the 30 professionally animated presets into the FCPX time line and let ProBrand Reveal Volume 6 do the rest. Easily adjust the style of background effects with intuitive sliders and color controls. Users can adjust background effects that include tints and blurs. 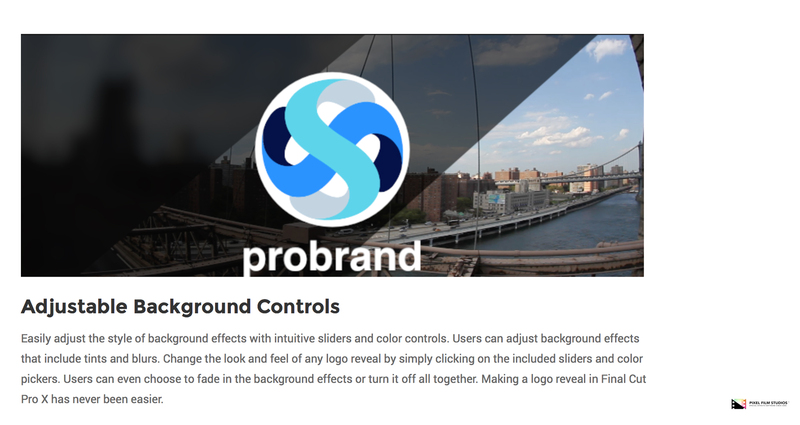 Change the look and feel of any logo reveal by simply clicking on the included sliders and color pickers. Users can even choose to fade in the background effects or turn it off all together. Making a logo reveal in Final Cut Pro X has never been easier.